UPDATE: thanks to PS860 posting in the comments, the unidentified array is a 1RL23 (SCORE BOARD) IFF system. It's also a very small unit, and due to the size I misidentified the position in the imagery below. It actually sits east of the domed structure, and does not appear visible in the imagery. At least I got the IFF interrogator part right! Rebel forces recently captured a radar site in northwestern﻿ Syria on 26 June, and subsequently released a video showing various radar systems. 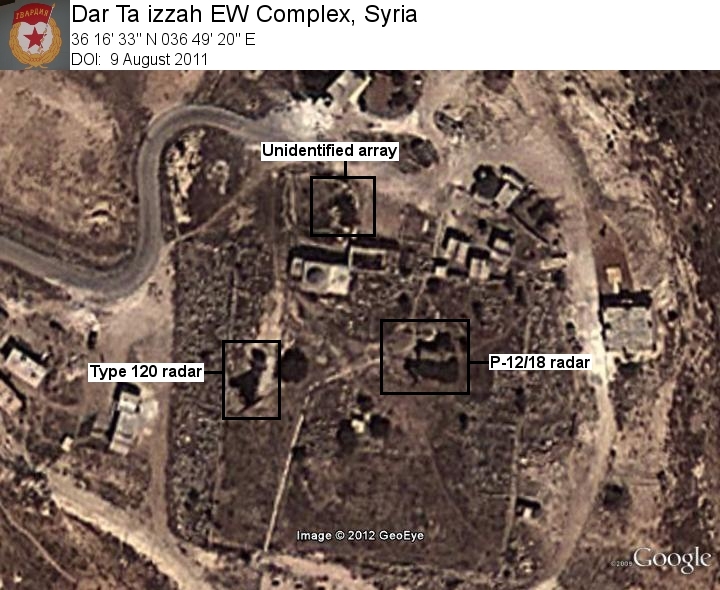 The image below depicts the radar site as it appeared in August of 2011. The site is located among the Sheikh Barakat ruins roughly 2.5 kilometers west of Dar Ta izzah in northwestern Syria, roughly 12 kilometers from the Turkish border. The site is noteworthy as it contains both FSU and Chinese EW sensors. An FSU P-12/18 (SPOON REST) radar system is present alongside a newer Chinese Type 120 2D surveillance radar. A third as yet unidentified array also appears in the video, and may represent either an additional radar array or an IFF interrogator. The Type 120, along with JY-27 (WIDE MAT) radars noted at two other EW complexes east of Damascus, highlight the Chinese industry's connection with Syria. Given that the Type 120 represents a target acquisition sensor for SAM support in Chinese service, it is prudent to speculate as to whether Syria has acquired modern Chinese SAM systems to improve its air defense network. 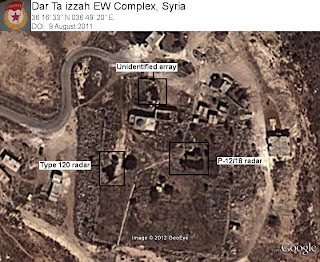 The Type 120 first appeared in imagery of the Dar Ta izzah EW complex in June 2010, with the JY-27 present at one of the southern EW sites as early as August of 2009. It is therefore likely that the arms shipment containing these sensors was delivered no later than early 2009. I ended up going with only two topics: Syria's SAM Network (hey, I figured it might be relevant...), and a contributor piece by Daniel Videre on the sources of water at the Tabriz S Silo Complex in Iran.﻿ The other two potential topics have been shuffled around. The Russian radar information will now be present in a new feature I'm penning for IHS Jane's covering the modernization of Russia's strategic nuclear arsenal. As part of that I'll be covering the ABM network, as there have been a lot of new BMEW changes, and I believe the new radars may play into that. Did I say radars? That's right, I found another one, a wholly different system. At any rate, if you can get ahold of the Intelligence Review issue with the article, pick it up. There will be a large quantity of previously unpublished (i.e. you can't find this stuff in Google Earth) overhead imagery from Digital Globe and GeoEye. There are definitely benefits to working with a professional organization willing to find any available imagery to play with! The Korean ADD Facility Analysis will also be in next month's I&A; I'm searching for more information on some of the recent weapon systems tested at the various complexes to include in the report. I know, I know, June's I&A will be a little bit short, but this should give Daniel's article a bit more attention, which it definitely deserves. I've mentioned it before, but it deserves mentioning again: for a bunch of guys doing this for free, the contributors I have collected so far are doing first-rate work. I've also got another new one lined up, who I hope to get involved in either July or August. Also to combat the shortness, I've been prepping a number of articles for the next few issues, so expect an increase in content again. Also, I've pretty much finished with rearranging the SAM Site Overview file, with the exception of the chore of identifying all of the damn Chinese arrays, so those files will go up once I&A is done with for June. Lastly, I'm contemplating various ways to alter the format of I&A to clean up the presentation a little bit. Maybe a smaller font, maybe a revised layout for a few things. Don't expect to see anything different until next year though; I have no desire to completely reformat the entire "Red October" issue's contents at this point! All for now. And who decided to let it be so hot outside here this week? Of this I do not approve. Just about done with the updating. For now all that has been accomplished is a sanity check of individual locations (which took a lot of time given that there are well over 7,000 sites), with some updates and deletions. I have yet to go through China's EW sites to reattack the radar ID issue, that'll be next. One thing I have decided to do is go through Russia and China and break everything down by military region. In these two cases, you'll be able to open the country folder, and see a series of subfolders for each MR. These folders will be organized the same way the country folders are now, with subfolders for active sites, facilities, etc. Also, the MR subfolders will also be "clickable" the same way country folders are now. When you click on Russia, for example, a window will appear giving you the overall totals for Russia. Then when you click on the Western Region folder, for example, you'll get the totals for that individual region. This will make things like updating the Russia and China air defense articles for I&A that much easier as well, as I will no longer have to spend time separating everything out. When the Russia and China breakdowns are done, I'll update the files. Doing China's EW sites will be a bit more time consuming so it'll likely appear in the next update. I also may go back and heavily alter the Historical Sites idea, using it only to store sites that have actually disappeared. Given that some countries re-use old SAM sites for newer systems (like Russia) I can't justify moving, say, their SA-2 sites into the Historical section en masse. If it can't be done there, it shouldn't be done anywhere in order to maintain consistency. Working a few new projects for IHS Jane's as well, more details on those to follow when it gets closer to publication. For now, pick up the next issue of Defence Weekly, I just might be quoted in there. The June I&A is coming along, with a few interesting topics. There will be a Syrian air defense network piece, an examination of what might be a new radar in Russia, an overview of Korea's ADD complexes, and a contributor piece on Iran. And anything else I can think up in the next few days! It'll be out by the end of the month. All for now, except that if you haven't 1) seen Prometheus, 2) heard The Industrialist, or 3) acknowledged the superiority of the Heat, then, well: summer, you're doing it wrong. Beyond that, are there any ideas out there for ways to further improve the file? If you've got suggestions, throw 'em into the comments. I'll try and reply to each suggestion and tell you if I like the idea and will do it, or why I might not like the idea and won't. First, some housekeeping. Given that this is the first serious attempt at documenting anything interesting in the most recent Google Earth imagery update, here's how it will work. The post title will have the date of the imagery update as displayed in the Google Earth imagery update kml file. So don't be confused when today is 1 June and you see the post title with 29 May! Also, I've tagged the post with the Google Earth label, and created a new one called Imagery Update. From this point forward if you find the Imagery Update tag in the label list, you can then view all of the relevant articles talking about Google Earth's imagery updates. Also, I'm not going to detail every little thing or every updated location. If you want that, head over to the Google Earth Blog. They do a great job of both announcing updates and listing locations as they're discovered. This will serve to highlight some of the amusing new imagery, or maybe amusing updated imagery, of places of interest to myself and readers of this site. On to the update. The Google Earth imagery update on the 29th was pretty impressive. Lots of new imagery incorporated, mostly a bunch of smaller cels. One new location now visible in high resolution is the Nenoksa SLBM test complex west of Severodvinsk. Which sounds like a really great place for an I&A Facility Overview! There's new imagery of a lot of the PLA's 830th Brigade complexes at Kunming, but nothing earth-shattering to report. May 2011 historical imagery of the southwestern 53T6 ABM site around Moscow shows some sort of work at one of the silos, and there's a GAZELLE transloader parked in the vehicle area. In terms of the SAM Site Overview file, an interesting development is the deployment of a 55Zh6 TALL RACK CVLO VHF-band radar north of Orsha in Belarus. This makes two of the systems identified in Belarus at this time. The most irritating update is a block of new imagery from late 2011 in Baku, Azerbaijan...which is still of no help as to locating their S-300PMU-2 components.